Putin puts his feet on the Arctic ice and on the resources rich bottoms. The US tries for now only to regulate the freed Arctic Waterways. Arctic – North Pole camps planned for Russian paratroopers, scientists. There will be two Russian North Pole bases of operation this summer — one a set of floating camps to be used by scientists, and the other a site for Russian soldiers to train on ice. Putin’s government, dissatisfied with the pace of work performed by state-owned Rosneft and Gazprom, is considering changing policy to open up the Arctic shelf to private companies. If that happens, Lukoil — Russia’s top private oil producer — would benefit. Arctic Committee forms to tackle Arctic waterways safety. The Arctic Waterways Safety Committee, formed to develop the best practices for managing Arctic waterways, held its first formal meeting this month in Juneau, electing officers and meeting with the governor and Alaska’s state committee on the Arctic. Welcome to the State of the QUAKENADO say OKLAHOMA Jokesters. Oklahoma Shakes: Earthquakes and Their Connection to the Oil Industry. Who has the worst job in the world? My choice this week is Austin Holland, the state seismologist for the state of Oklahoma. For years, this must have been a very sleepy job, tantamount to having a job studying coastal erosion in Iowa. But then Oklahoma has been on yet another oil and gas binge, and this apparently has made Austin Holland’s life a living hell. Oklahoma had a staggering 567 earthquakes registering over 3.0 in 2014. Scientists, to whom we must never listen because they threaten our freedom, have attributed this to the wastewater wells that the extraction industries dig deep into the earth. This has caused some consternation among the locals. Actually, ma’am, they do. That is the abiding truth of the extraction industries. The earth is theirs, including the earth under your house, and if, one day, the earth under your house becomes the earth over your house, that’s your bad luck. There are wells to be drilled in other parts of the earth that the extraction industries own. But don’t worry, your state government will study the whole business. State officials insist they are doing all they can to develop new regulations. In September, Gov. Mary Fallin (R) named a coordinating council to study seismic activity. And the Oklahoma Corporation Commission, an elected three-member panel that regulates oil and gas producers, has imposed new restrictions on wells in seismically active areas. Of course, the industry in question has its own science that it can throw out there concerning Forces Beyond Our Control. For the most part, Oklahoma oil companies and their representatives have declined to engage in the public debate. When industry representatives have ventured forth, they have denied responsibility for the quakes. At a luncheon hosted by the Oklahoma City Geological Society last summer, Glen Brown, a Continental Resources geologist, blamed a worldwide surge in seismic activity that has nothing to do with wastewater disposal. “There’s a hysteria that needs to be brought back to reality that these [quakes] are light and will not cause any harm,” Brown said, according to local news reports. The problem for the people of Oklahoma is that there is no politician who yet feels threatened enough by the people under whom the ground is shaking to stand up to the people whose reckless pursuit of private profit is causing the ground to shake in the first place. The state needs a political earthquake and those, alas, are much more unusual these days. A version of this op-ed appears in print on August 24, 2014, on page SR4 of the New York edition with the headline: The Climate Swerve. Stop Subsidizing Tax Dodgers and Tax Polllution Istead – do not tax good things – tax bad things. Professor Joe Stiglitz shows how to fix the World – why are we not allowed to follow him? AMAZING – I just spent two days at the yearly meetings of the Austrian Economic Association that this year dealt with: ECONOMICS OF INEQUALITY and had as key-note speaker Sir Tony Atkinson f Oxford U., and now I find in my incoming e-mail an article from Bill Moyers talking to Professor Joseph Stiglitz of Columbia U. who is President of the International Economic Association and cooperates with Sir Atkinson, something that nails the same topic down in excellent journalistic terms. Yes – clearly – we are doing everything wrong when it comes to build an economy – Why? The Vienna meeting was held on the new campus of the Business University – WirtschafysUniversitaet Wien – in a building funded by the Austrian oil Company OEMV that is just in the news for the ill-advised South Stream Pipeline that is being planned to bypass The Ukraine when bringing to the EU Russian Gas – and was just shut down by the EU Commissioner for Energy who clearly does not want responsibility for this politically most miserable attempt by an oil company and a EU Member State to make money from fossil fuels and undermine a European Effort to go instead for Renewable Energy. Professor Joe Stiglitz unmasks here this self-righteousness of the rich that think the World is their oyster and they have a Constitutional right to rob and legally cheat. The implications are immense and reach into globalization and efforts to enlarge the scope of international piracy using multinational trade agreements to undo healthy laws in countries that somehow managed to pass such laws. Joseph E. Stiglitz: Let’s Stop Subsidizing Tax Dodgers. new report by Nobel Prize-winning economist Joseph E. Stiglitz for the Roosevelt Institute suggests that paying our fair share of taxes and cracking down on corporate tax dodgers could be a cure for inequality and a faltering economy. BILL MOYERS: Welcome. 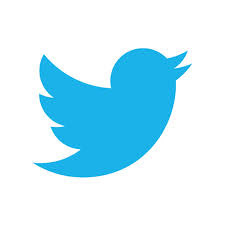 Avoiding taxes has become a hallmark of America’s business icons; Apple, Google, GE, and many more of the Fortune 500. The nation’s largest corporations are sitting on more than $2 trillion in cash while revenue from corporate income taxes have plummeted from just below 40 percent in 1943 to just below 10 percent in 2012. Government and big business have colluded to create what’s tantamount to an “unlimited IRA” for corporations. That’s not my term, although I wish I had thought of it, because it explains so much about what’s gone wrong in a country where some 20 million workers who would like a full-time job still can’t get one. Yet the upper one percent of the population takes home a staggering 22.5 percent of America’s income while their effective federal income tax rate has dropped. No, the phrase was coined by Joseph Stiglitz, a man eminently worth quoting, a Nobel Prize winner and one of the world’s most influential economists. Currently he’s president of the International Economic Association. Former chairman of the Council of Economic Advisors under President Bill Clinton, and the author of best-selling books that have shaped worldwide debates on globalization, income inequality, and the role of government in the financial marketplace. Now he’s written one of his shortest but most important works: this white paper, published by the Roosevelt Institute where Joseph Stiglitz is a senior fellow. It’s a mere 27 pages, but in clear and cogent prose, backed up by facts and figures, it lays out a plan that not only would reform our taxes but create jobs and strengthen the economy. I’ve asked him here to tell us about it. Welcome. JOSEPH E. STIGLITZ: Well, let me put it in a broader context. Our country needs, faces a lot of challenges. We, as you mentioned, 20 million Americans would like a full-time job and can’t get one. We have growing inequality. We have environmental problems that threaten the future of our planet. I think we can use our tax system to create a better society, to be an expression of our true values. But if people don’t think that their tax system is fair, they’re not going to want to contribute. It’s going to be difficult to get them to pay. And, unfortunately, right now, our tax system is neither fair nor efficient. Look at the tax rate paid by that one percent. It’s much lower than the tax rate paid by somebody whose income is lower who works hard for a living, as a percentage of their income. You know, Warren Buffet put it very – why should he pay a lower tax rate on his reported income than his secretary? And the interesting thing that he didn’t emphasize was most of his income is in the form of unrealized capital gains. BILL MOYERS: Unrealized capital gains are not taxed as long as the owner keeps them, right, doesn’t get rid of them? JOSEPH E. STIGLITZ: That’s right. And what’s even worse, if you’re a corporation and you even realize the capital gains but you’re abroad, you don’t bring the money back home, there’s still no taxes. As long as they don’t bring the money back here, it accumulates, it grows and grows and grows, and they get wealthier. But it’s even worse than that. Because it means that they have an incentive to keep their money abroad. BILL MOYERS: Yeah. There are several startling statements in your report. This is one of them: “our current tax system encourages multinationals to invest abroad.” And create jobs abroad, as you just said. And yet, these are people who defend their practices by saying, we are the job creators, we’re the job producers. And yet, you say they have an incentive to send jobs abroad. JOSEPH E. STIGLITZ: Exactly. Americans of all income groups are entrepreneurial. You got people across our income distribution who, when there’s a demand, respond to that demand. But if there’s no demand, there won’t be jobs. Now, the problem is that the people in the one percent have so much money that they can’t spend it all. The people at the bottom are spending all of their income and hardly getting by. In fact, a very large fraction of those in the bottom 80 percent are spending more than their income. And it’s part of the instability of our economy. So, the point is this inequality contribute, to which our tax system contributes actually weakens our demand. And that’s one of the main messages of my report, which is if we had a more progressive tax system, we could get a more efficient economy. Because there would be more jobs being created. BILL MOYERS: So, these 20 million people I referred to, and you referred to in your report, who are looking for full-time work but can’t find it, if they had that work, they’d be spending their money. They’re not going to send it to the Cayman Islands, right. JOSEPH E. STIGLITZ: That’s right. Reinforce the tax code, which has led America to be the country with the highest level of inequality of any of the advanced countries. JOSEPH E. STIGLITZ: –twenty years ago. And everybody was talking about how much money you were giving to the poor people. It wasn’t, if you actually looked at the amount of money, it wasn’t that much. But we said, well, you’re also giving away a lot of money to rich corporations, directly and indirectly. Most of the indirect way is through the tax system. So, for instance, if you give special tax provisions for oil companies, so they don’t pay the full share of taxes that they ought to be paying, that’s a welfare benefit. Lots of other provisions in our, hidden in our tax code basically help one industry or another, that can’t be justified in any economic terms. And, so, that’s where we coined the term “corporate welfare.” It’s caught on. And because it says it’s a subsidy, but not a subsidy, help going to a poor person, which is where welfare ought to be going, but going to the richest Americans, going to our rich corporations. BILL MOYERS: So, we have a tax code that encourages people to– encourages companies to send their profits abroad, to send jobs abroad, and to reward owners of their company whose money may not come back to the United States? JOSEPH E. STIGLITZ: It doesn’t make any sense, you might say. And the fact it doesn’t, you know, one of the reasons I wrote the paper was, you know, there’s a lot discussion going on about we have a budget of deficit. And we have to slash this, and slash that, and cut back education, and cut back research, things that will make our economy stronger, cut back infrastructure. And I think that’s counterproductive. It’s weakening our economy. But the point I make in this paper is it would be easy for us to raise the requisite revenue. This is not a problem. This is not as if it’s going to oppress our economy. We could actually raise the money and make our economy stronger. For instance, we’re talking about the taxation of capital. If we just tax capital in the same way we tax ordinary Americans, people who work for a job, who pay taxes we pay on wages. If we eliminate the special provisions of capital gains, if we eliminated the special provisions for dividends we could get, over the next ten years, over, you know, approximately $2 trillion. And those are numbers according to the CBO. And so, we’re talking about lots of money. BILL MOYERS: The figures make sense to me. But the politics doesn’t. Because these are the people, once again, who dominate our system with their contributions to the politicians who then have no interest in changing a system that rewards their donors. JOSEPH E. STIGLITZ: We have this vicious cycle where economic inequality gets translated into political inequality. It gets translated into rules of the game that lead to more economic inequality, and which allow that economic inequality to get translated into evermore political inequality. So, my view, you know, the only way we’re going to break into this viscous cycle is if people come to understand that there is an alternative system out here. That there is an alternative way of raising taxes, that we are not really faced with a budget crisis. It’s a manmade crisis. You know, when we had the government shutdown, we realized that that was a political crisis. That wasn’t an economic crisis. And the same thing about our budget crisis, you know. It’s not that we couldn’t raise the revenues in a way which actually could make our economy stronger. We can. If we just had a fair tax system, to tax capital at the same rate that we tax ordinary individuals, if we just made those people in that upper 1 percent pay their fair share of the taxes they got 22.5 percent of the income, well, let’s make sure that they pay a commensurate part of our income tax, if we had taxes that would be designed to improve our environment. JOSEPH E. STIGLITZ: A general principle that we’ve known for a long time, a lot better to tax bad things than good things. Rather than tax people who work, let’s shift some of that burden into things that are bad, like pollution. BILL MOYERS: You make it sound so easy. And I’m still hung up on your saying, you know, it would be easy to do these things. And yet, if they were easy, why haven’t we done them? JOSEPH E. STIGLITZ: Well, that’s the politics. The fact is that we have a political process that I won’t say is broken, but is certainly not functioning the way we think a democracy is supposed to function, you know. In democracy, supposed to be one person, one vote. And there’s a well-developed theory about what does that imply for the outcome of a political process? We talk about it, called the median voter. It should reflect the middle, you know. Some people want more spending. Some people want less spending. Some people, you know, so the nature of democracy is compromise. And it’s supposed to be compromise sort of in the middle. But that’s not we have today in the United States. We have a tax system that reflects not the interest of the middle. We have a tax system that reflects the interest of the one percent. BILL MOYERS: Let me cite some examples of the biggest tax dodgers. These come from the organization, Americans for Tax Fairness. Citigroup had $42.6 billion in profits offshore in 2012 on which it paid no U.S. taxes. Exxon Mobil had $43 billion in profits offshore in 2012 on which it paid no U.S. taxes. General Electric made $88 billion from 2002 to 2012 and paid just 2.4 percent in taxes for a tax subsidy of $29 billion, I could go on. Pfizer, Honeywell, Verizon, FedEx, Apple. What goes through your mind when you hear these figures? JOSEPH E. STIGLITZ: –by government spending. They’re willing to take but not to give back. So, there’s really a whole set of problems that concern it, ethics, equity, fairness, resource allocations. What they don’t seem to understand is our society can’t function if these large corporations don’t make their fair share of contributions. BILL MOYERS: Aren’t they likely to say, though, in response, well we do this because the law permits it. This is what the system incentivizes. JOSEPH E. STIGLITZ: Well the law does permit it. They use their lobbyists to make sure that the law gives them the scope to avoid taxes. So, this argument, oh, we’re only doing what the law allows, is disingenuous. The fact is they created, their lobbyists, their lobbying helped create this law that allows them to escape taxes, pushing the burden of taxation on ordinary Americans. JOSEPH E. STIGLITZ: Somebody has to make up the difference. I mean, we can’t survive as a society without roads, infrastructure, education, police, firemen. Somebody’s going to have to pay these costs. BILL MOYERS: Summarizing what you say in here about your proposal, raise the corporate tax rate, but provide generous tax credits for corporations that invest in the U.S. and create jobs here. Eliminate the loopholes that distort the economy, increase taxes on corporations, the profits of which are associated with externalities such as pollution, reduce the bias toward leverage by making dividend payments tax deductible, but imposing a withholding tax. I mean, these seem so common-sensical that a journalist can understand them. But they don’t get into the debate. JOSEPH E. STIGLITZ: On incentives that we’ve created a tax system that has an incentive to move jobs abroad. And what I want to do is create a tax system that has incentives to create jobs. And if you tell a corporation, look it, if you don’t create jobs, you’re taking out of our system, you’re not putting anything back, you’re going to pay a high tax. You know, in this, the first three years of the so-called recovery, between 2009 and 2012, 95 percent of all the gains went to the upper 1 percent. So, the American workers are not participating. And the reason they’re not participating is there’s just not enough job creation here at home. And, so, this is a way of trying to incentivize all these corporations who are sitting on all this money abroad to start using some of their huge resources, some of all those benefits that we’ve given them, for the benefit of the American people. BILL MOYERS: You move in circles where you come into contact with the CEOs of these companies, many of whom are deficit hawks, you know. They keep, they’re on committees. They keep testifying in Washington. They call for deficit reduction. What do they say when you make this argument to them face to face, as you’re making it to me? JOSEPH E. STIGLITZ: Most of them are not economists. And most of them are concerned with their corporation’s own bottom line and with their own salary. So, we’ve created a corporate system in the United States where the CEOs’ pay is related to the shareholder value. The shareholder value is related to how little taxes they pay. Because if they get the taxes down, profits look high and people will pay more for their shares. So, when they’re making an argument for, let’s lower the corporate income tax, let’s lower taxes that I have to pay, let’s expand corporate loopholes, they don’t use those words. But what they’re really saying is, pay me more, because if I succeed in getting Congress to do that, my pay goes up, not because I’ve worked harder. I haven’t invented something new. I haven’t made my customers happier. I made my company more valuable by succeeding in getting provisions that allow my company to avoid taxes. And then, my shareholder value goes up, and my salary goes up. As if to prove a point, the U.S. House of Representatives, functioning these days as a legislative bordello for corporate America, is moving to extend and make permanent six separate tax cuts for big business. The whole package would come at a cost of $310 billion, virtually wiping out all the deficit reduction from last year. One of those tax credits, for research and development, already has been approved, at a cost over the next ten years of $156 billion. That’s 15 times as much as it would cost to extend unemployment benefits. Did House Republicans offer to renew help for people out of work? Nope. They’re deficit hawks, and they said there’s no money to pay for it. Of course they could just ask their corporate friends to give the tax breaks back. But that would be asking too much, especially on the eve of the fall Congressional elections when secret or dark money from you-know-who will flow into you-know-whose campaigns like….well, like champagne on the company jet. Yet another reminder that you need not impose fraud on people by stealth if you can succeed by law. Next week, more on politics, taxes, and inequality with Joseph Stiglitz. BILL MOYERS: At our website, BillMoyers.com, we’ll link you to Joe Stiglitz’s white paper for the Roosevelt Institute. You’ll also find a list there of ten corporate tax dodgers whose names and brands we bet you’ll recognize. Ambassador John W. Ashe, the current President of the UN General Asssembly, is a great man – He arranged a cellebration of the International Mother Earth Day on April 22, 2014, but even he could not get the UN Department of Public Information to publicize this before it happened. THE FOLLOWING WAS MAILED OUT BY UN DPI ON “Tue, Apr 22, 2014 at 4:38 PM.” Iassume that this is Vienna time which makes it 10:38 AM New York time. It was supposed to bring attention to an event that day that was being held “10:00 am – 1:00 pm. Is Anyone still naive enough to hope that anything practical can come out from the hands of this UN Secretariat Staff? YES – the UN has some great people in its midth but they are turned impotent by a permanent UN staff that was set up by governments of OIL that have no interest in environment, climate change or the fate of indigenous people that live from the land. This posting of ours comes to highlight what we were saying for many years – and the fact that even the UN Secretary-General, who we think might harbor the right feelings, and might have surrounded himself with the right people, but not having had the guts to throw out half of the UN staff he inherited has simply turned to zero the chance of having an impact on important matters. We are very sorry for this. The Governments of Bolivia and Ecuador and representatives of the North American Indian Nations still believe in Mother Earth and are not ready to give up the fight for changing our behavior to one that allows us no live in harmony with the planet rather then exploiting it. Man ought to be the warden of Planet Earth and not its destroyer – but this is not the religion of MAMMON as represented at the UN by the Oil Barrel. The United Nations will hold the fourth Interactive Dialogue of the General Assembly on Harmony with Nature to discuss and promote ways to integrate the economic, social and environmental dimensions of sustainable development. The Dialogue also commemorates International Mother Earth Day, which highlights the need to move away from a human-centred worldview and focuses on the relationship between the planet and humankind as an equal partnership. The Dialogue will address key characteristics to build an Earth-centred paradigm and strategies for building it. President of the General Assembly John W. Ashe will open the Dialogue, along with State and civil society representatives. The statements will be followed by four panels with experts on topics such as nature and politics, farming, and harmony with nature in the post-2015 development agenda. Mr. Sacha Llorentty Soliz, Permanent Representative of the Plurinational State of Bolivia. Florencia Soto Nino, sotonino@un.org, 917-367-4833; UN Department of Public Information. All right – perhaps someone will try to find out what happened after-the-fact – surely not having been able to talk to any of the guests that came specially to speak at the event – the likes of the Minister from Ecuador and out-of-towners from academia or members of pro-Earth organizations. Some at the DPI seem to like the role of gate-keepers for the media and keep the media away from information not sanctioned by members of the staff. World Trade developed as an issue of bulk we called commodities. Are things changing now asked Dr. Jose Antonio Ocampo. We also found separately a commodity we called Hatred, another which is honest reporting. Actually – the title of the speech at the lunch organized yesterday by the Brazilian, Colombian, Ecuadorean Peruvian and Venezuelan – American Associations or Chambers of Commerce “- with Dr. Ocampo – was: “IS THE COMMODITY BOOM IN LATIN AMERICA ENDING? The speaker who is now professor at Columbia University is very well known to us since his having been Finance Minister in Colombia, an official at the World Bank and the UN and member of many studies and panels – in effect searching our own website one finds many references to him. Traditionally, Latin America is an exporter of Natural Resources we call Commodities because we used to say they are fungible – if the producer wants to increase price we will go to someone else who makes the same product – so exchanges just dealt with the bulk in many cases even not specializing – that is except for just a few items like sugar, coffee, cocoa, but forget wood, minerals, oil, coal – these were just means of getting the resources of the South to an industrialized North at fire-sale prices. In the exporting countries a few in the government circle got rich – and the many got meager salaries provided they played the game. Country economies were measured in GDP terms without any attention to who gets that income and why. We know that the World economy had a slow down – but commodity purists say that 2004 – 2007 was the best time for commodity exports in the last three decades. Now they look at the possibility that World Growth Prospects are slowing by much and this is not just in the movement of goods. In effect Dr. Ocampo enlarged the subject also to Migrant flows and Remittances, and access to International Financial markets – that were best since the second half of the 1970s. What has happened since 2011 is that growth has slowed by 30% despite a strong business cycle – not any different then in the US itself I must add – and this must be an eye opener to all those young unemployed that prepared themselves for a life on the boom. Dr. Ocampo found within the commodity business boom also a South-North regional pattern that will harm poverty reduction efforts – and he reaches the conclusion that due to the weakening of the World Trade, the space for orthodox export-led policies may be over, he said. On the other hand, a pure inwards-looking strategy would work only for very few countries – perhaps Brazil – he said. A sponsored expansion of the domestic markets. When it came to the Q&A – a question that seemed to me out of place was about entrepreneurs and small business. This is indeed very important for the social structure of the country, and for the economy at large – but does not touch the Commodity issue because that issue was always in BIG Hands. I tendered a different question which I predicated by saying that I am trying to deconstruct the concept of Commodities – a concept that in my eyes never had standing in the economy. I mentioned that some of the commodities are non-renewable and when exhausted leave only problems behind and an impoverished Nation. Within this group there are technology induced changes – like the foreseeable demise of the Copper market and a new demand for Lithium . But then there are Commodities based on Renewable Resources that do not harm the future of the State. But even here there are effects from the outside – this like the demise of Leopard Skins or Ivory and Rhinoceros Tusks from lists of Commodities. So, my actual question is if time has not arrived to look at each exported good separately rather then bunching them into the term of Commodities where the exporters of bananas once thought they could build up a power equal to that of OPEC. I took then the 50 Street Crosstown bus to get to the UN where a group that claims solidarity with the Palestinians was hosting Mr. Emad Burnat from the village of Bil’in – a farmer and self-styled cameraman whose documentary “5 Broken Camera” is being promoted by activist Oscar-winning filmmaker Michael Moore. Emad Burnat started filming in 2005 daily life in his village, and clearly had the talent to bring out the abnormal life under a foreign occupation – that is if you consider living in the Colorado State of the Columbine shootings as normal, or life in any village in an Arab State normal. I knew what to expect, but wanted to see how the UN sells the commodity of “Hate Israel” – because really – the hand clapping had nothing to do with trying to alleviate suffering of the Palestinians, but rather I saw there various people – some claiming Jewishness for unclear reason – and heaping it on Israel. There were so called Press or Media people that have never written a word about climate change, and there was an Arab who lived in Brazil and loves to speak Portuguese and Spanish for his outreach. I asked Mr. Burnat if he spoke ever with Uri Avnery – the Israeli maverick who was the one to bring to the public’s eye the problems the villagers of Bil’in were having, and who tried to help? After all the film-maker’s statement was that it is his intent to help the villagers and himself? I said that talking with people like Avnery can help him on the ground – and what can the people in this room at the UN actually do on the ground? As I did not get an answer to my very direct public question – just a few grunts and something that a TV reporter meant as an insult – “Zionist” I spoke to Emad after the presentation in private and then I heard from him that it is not about the village but larger, about Palestine. OK – so be it – the commodity at sale here is simple hatred – nothing else, but the problem is real and involves real people – and this is not his issue. I also said to him that in Israel people do not want to revisit the Holocaust and I would expect from him to not like the killing of the Syrian Arabs by Arabs – it does not make sense to score points over dead bodies. I must also note that the UN DPI that posts a list of UN activities for the information of the media – had the “5 Broken Cameras” information, but then never has other topics of general interest – like the presentation today by Ms. Angela Kane – The UN Representative for Disarmament Affairs who spoke on her experiences as head of the UN spearhead on the issue of Chemical Weapons in Syria. She was very diplomatic and made sure she says only things she can prove. The Syrian Ambassador could not have had reason to doubt her impartiality. She did her work out of her Vienna based headquarters and gave support to the UN Security Council – in case the UN wants to come up with decisions – but the question is will they? For journalists the question is what is actually going on – and this presentation could have helped them – but the UN Department of Public Information keeps the Information commodity very close to the Arab side – whatever that might be the case. OK, I am sure that I might have over extended the use of the term Commodities – but I do believe that there is indeed much more to this word if we try an ounce of real Aqua Vita. Individual Nations are suffering when the value of commodities is in decline – our job ought to be to explain why this happens – and the suffering – not of Governments but of their subjects. The UNSG High-Level Advisory Panel of 27 – said that we can now end globally Extreme Poverty by 2030. The article below is the excerpt of a commentary authored by Molly Elgin-Cossart, former chief of staff for the secretariat of the High Level Panel on the Post 2015 Development Agenda. In her commentary, Molly draws on her experience with the High Level Panel offering a valuable insight of the process by looking at its strenghts, weaknesses and lessons learned. Molly is a Senior Fellow on global development at the Center on International Cooperation (CIC), at New York University, USA. The UN Secretary-General’s High-level Panel of Eminent Persons on the post- 2015 Development Agenda (HLP) – a group of 27 eminent world leaders including a Nobel Peace Prize-winning Yemeni journalist, a Nigerian Minister of Finance, a Brazilian Minister of Environment, the CEO of Unilever, and three Heads of State/Government from Indonesia, Liberia, and the United Kingdom – came together a few months ago to make a deceptively simple statement at the United Nations: we can end extreme poverty by 2030. For the first time in history, we have the knowledge, tools, and resources to Leave No One Behind. Not only that, we can do it as part of a broader economic transformation that will lead to sustained prosperity for all, and in a way that preserves our planet, for this generation and those to come. 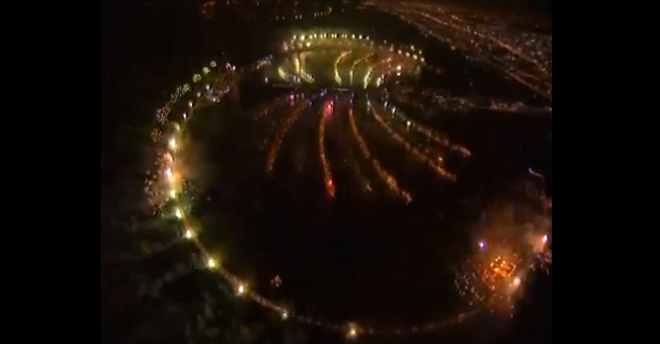 This is an extraordinary moment. Never before has the opportunity to share prosperity been more within reach. To say that not a single person need live in the most desperate circumstances may sound innocuous. It may sound as if it is inevitable. But that is not the case. Continued growth will continue to reduce poverty, but it will not end it. Cycles of poverty, perpetuated by injustice and inequality, trap the most vulnerable individuals and prevent them from fulfilling their potential. Often the poor are subject to overlapping forms of discrimination. For example, women who live with disabilities in isolated rural areas face a fight even to survive, let alone prosper, due to the discrimination, lack of mobility, and social exclusion they face. Only through a transformational approach can we hope to give every person on this planet the chance she deserves. The members of the HLP agreed that we can – and we must – transform the way we approach development, to tackle global challenges through a new global partnership to end extreme poverty and put the world squarely on the path to sustainable development. Crucially, though, the HLP report, A New Global Partnership: Eradicate Poverty and Transform Economies through Sustainable Development, is not the final word on the post-2015 development agenda. The world’s next development agenda will be decided at a summit of Heads of State in September 2015. Between now and then, global leaders will discuss the future of poverty and sustainable development. Will they rise to the challenge? Or will they let the chance pass them by, distracted by problems at home and the frustrations of international negotiation? It will be a difficult journey to agreement in 2015. But the stakes are too high to allow leaders to shirk their responsibility to get serious about taking action to confront the challenges we face, from poverty to inequality to environmental degradation. Because the deliberations of the HLP provide a preview of the debates to come, reviewing some of the lessons of the Panel’s experience may provide insight into the next two years of negotiations. The Panel’s journey from London to Monrovia to Bali – through debates, discussions, and consultations, led them to a worthwhile destination: a coherent, effective and sustainable road map to tackle global challenges. Yet more than the destination, it is the Panel’s journey that offers insight on navigating the rough waters ahead to 2015. What follows are a few key observations from my experience as Chief of Staff of the Panel secretariat that I think are worth highlighting as we head into two years of intense multilateral negotiations. Poems – Witness Poetry – Esthetics of Truth Against Forgetting from Paul Celan, Edmond Jabes, Walter Benjamin, Wislawa Szymborska, Mahmoud Darwish, Thomas More, Aga Shahid Ali, Emanuel Levinas, Jacques Derrida … by Carolyn Forche. Can Atrocity Be the Subject Matter of Poetry? hey all died of hunger. “All. How many? Alongside poets whose primary trauma was the Holocaust, Forché included works by Latin Americans, Russians, Eastern Europeans, and Arabs, often in remarkably good translations. The anthology made it possible to link the fractured stanzas of Celan (“no one / bears witness for the / witness”) to the lyrics of Mahmoud Darwish, another poet of traces and inscriptions, whose verse establishes a counter-history of Palestine. If the poetry of witness is in some sense an invented tradition, then Forché’s anthology was nevertheless a valuable one. By placing such disparate poets together in one book, she allowed the reader to make unexpected, even startling, connections, which is what anthologies do at their best. Now Forché has collaborated with Duncan Wu, a professor of English Romantic poetry at Georgetown, to edit a second big anthology, “The Poetry of Witness: The English Tradition, 1500-2001.” The collection begins with verse by Thomas More and ends with a ghazal by Agha Shahid Ali. Many of the selections are war poems, mainly from the English and American civil wars and the two world wars, while others take up the cause of abolitionism or women’s rights. There are a number of poems composed in prison, some in sight of the gallows (Wyatt’s “Sighs are my food, drink are my tears”), as well as devotional verse and, particularly in the modern period, many elegies. It isn’t always clear why these poems belong in the same book, or why they count as poems of witness. Each editor has written a separate prefatory text, and it is difficult to make the two match up. Forché’s essay in the collection, “Reading the Living Archives,” repeats many points made in her introduction to “Against Forgetting.” She enlists the philosophies of Emanuel Lévinas and Jacques Derrida to her notion of witness poetry, but makes no mention of English-language verse. And, in fact, it is hard to see how Lévinas’s notion of witnessing as “the owning of one’s infinite responsibility for the other” could help one to determine a selection of poems. Perhaps Forché’s essay wasn’t written with the present anthology in mind, but, then, one wonders what it’s doing here. Duncan Wu’s introduction sets out the editorial criteria more straightforwardly. Unlike Forché, he emphasizes the poetry of witness as a type of political verse. “The poems in this book are acts of resistance,” he claims. “Some of our authors defy injustice to the extent of incurring the wrath of those willing to impose the ultimate sanction of death; some face risks, whether on the battlefield or in the forum of public debate.” This seems an overstatement. It is true that Marvell’s “An Horatian Ode Upon Cromwell’s Return from Ireland,” arguably the finest piece of political rhetoric in English, is no mere panegyric. It manages to elegize Charles I and to register Marvell’s doubts about Cromwell’s scorched-earth tactics in Wexford and Drogheda. But to call it an act of resistance stretches the sense of that phrase. There is something frustratingly vague about the notion of a poetry of witness, even in Forché’s initial formulation. Does the poet of witness need to have direct experience of the events in question, as seems to be the case with “The Colonel,” or can witnessing take place at a distance, so to speak? Some of the most powerful poetry of witness—Charles Reznikoff’s “Testimony,” for example, or the pages devoted to the Armenian genocide in Les Murray’s “Fredy Neptune,” neither of which appear in this volume—does not rely on having been present at the events in question. And what, exactly, is an “event”? Is there a common scale of experience between a solitary death, a protracted civil war, and a genocide? Wu’s conflation of witness poetry with political verse may add to the confusion. “The Poetry of Witness” includes many works by nineteenth-century women’s-rights advocates and critics of slavery, “motivated by their willingness to denounce religious or political injustice,” as Wu writes. But is denouncing the same as bearing witness? And why are only these movements represented in the anthology? Bearing witness—as Forché does, at least, seem to recognize—is a politically neutral action. There is nothing inherently progressive about being a witness. (Ezra Pound on Hitler: “Like many martyrs, he held extreme views.”) The editors’ decision to include the voices of heroic liberalism also means there is too much verse that is, by all conventional criteria—vividness of language, ability to surprise, techniques of rhyme and rhythm—very bad. Yes, injured woman, rise, assert thy right! Resume thy native empire over the breast! For all their arguments about the past, one senses that both editors are ultimately concerned about the poetry and poets of today, as many anthologists are and should be: a tradition needs heirs. In his introduction, Wu argues, “The concentration of contemporary poets on the realm of the personal, almost to the point of myopia, is peculiar to recent times. Prior to that, poets commonly discussed experiences shared by the larger community in which they lived.” Lots of critics tell the same story. Whereas poetry was once a public art addressed to a broad audience, it has become—since around the sixties—the concern of a coterie, incomprehensible even to educated readers. Rather than discussing the experiences of the larger community, poetry has retreated into the workshops of Master’s programs, where its death throes go on unnoticed by the rest of the culture. This story isn’t wholly inaccurate. Who would deny that poetry occupies a more and more restricted terrain in our republic of letters? But this isn’t because poets refuse to discuss the experiences of the larger community. In fact, much of the smartest poetry being written today is explicitly political, though I would not call it a poetry of resistance or denunciation. “The Poetry of Witness” argues for the importance of a public-spirited poetry, willing to speak the truth to power. This is an important argument, but I wonder if its lessons and examples will instruct contemporary poets. The best of them seem to think of poetry’s possibilities along rather different lines than the verse of this anthology (though perhaps not so differently from Walt Whitman). Not as acts of resistance or denunciation but, rather, as efforts to reimagine, for our own time, what is public, what is poetic, and how they might come together. The Washington Post, in an Exclusive based on Snowden, tells us that when our Google-mail (gmail) sends us an advertisement that is their money making business, they also open the way for government surveillance of our mail. Could Internet Communication Consummers find a way to reorganize outside this US Business and Government Complex? This seems to us to be also an issue appropriate for the Human Rights Day. We believe that Dilma Rousseff of Brazil agrees. The Women pay for Austerity that allows the Rich to become Richer and the Workers’ Wages to Drop to Victorian Levels. The poorest pay the price for austerity: Workers face biggest fall in living standards since Victorian era. Monday 09 December 2013 by Nigel Morris for The Independent. The number of public sector workers on low wages doubles to more than one million, with women and part-time staff disproportionately affected by squeeze on incomes. The NEF has calculated that the public sector now employs one million low-wage workers – double the previous estimate – with health and social care staff, classroom assistants and council employees trapped on small earnings. Sales assistants and retail workers make up the largest group of low-paid workers in the private sector, with large numbers also working as waiters, bar staff and cashiers. The study blames the continuing drop in disposable incomes on pay freezes and below-inflation rises, leading to wages steadily lagging behind prices. Separate research by the Joseph Rowntree Foundation concluded yesterday that for the first time the number of working families living in poverty exceeds those without anyone in work. The cost of living has moved up the political agenda in recent months with Labour claiming that the average person is £1,600 worse off than when the Coalition Government took power in May 2010. Ministers counter that economic recovery is finally under way, with employment levels growing steadily, and that they have taken steps to lower the cost of petrol and energy and to raise the income tax threshold. However, one in four local authority employees is now on low pay, which is defined as less than 60 per cent of the average national income – equivalent to £7.47 an hour or £13,600 a year. As squeezed local councils award contracts to the cheapest providers, these workers are often even worse off than their counterparts employed directly by the public sector. “A care worker earns only £6.44 to £7.38 per hour in the private sector compared to £9 to £11 in the public sector,” the report adds. The Republican response to the unemployed is a mix of callousness and bad economics. Pain is on the way for the next mayor, despite Mayor Michael Bloomberg’s proposal for a balanced budget. A PAX FRANCESE in the Middle East? Why Not? First bomb Arak to get happy Saudis and Israeli will to stop building in Judea and Samaria; while Abbas agrees to tone down the talk about a return to Israel. Jrusalem (AFP) – France will never tolerate nuclear proliferation, President Francois Hollande vowed on Sunday as Israel expressed “grave concern” about a looming deal between world powers and Iran. As the French leader arrived in Israel on his first state visit, the question of how to curb Iran’s nuclear ambitions loomed large over his talks with Israeli President Shimon Peres and Prime Minister Benjamin Netanyahu. But as he sought to reassure Israel of France’s absolute determination to disarm Iran, he also made clear that the peace process was high on his agenda, saying Paris expected “gestures” from Israel over its construction of settlements in order to advance talks with the Palestinians. The visit comes three days before the P5+1 group of world powers are to resume talks with Iran in Geneva to eke out a deal for scaling back Tehran’s nuclear programme in exchange for sanctions relief. With Iran – Hollande laid out four demands which he said must be in place for any deal to be successful. “France is in favour of an interim agreement but on the basis of four points,” he said at a joint news conference with Netanyahu. “The first demand: put all the Iranian nuclear installations under international supervision, right now. Second point: suspend enrichment to 20 percent. Thirdly: to reduce the existing stock. French President Francois Hollande on Monday called on Israel to cease all settlement construction, praising Prime Minister Benjamin Netanyahu for halting the Housing Ministry’s recently announced plans for further apartments in the West Bank. 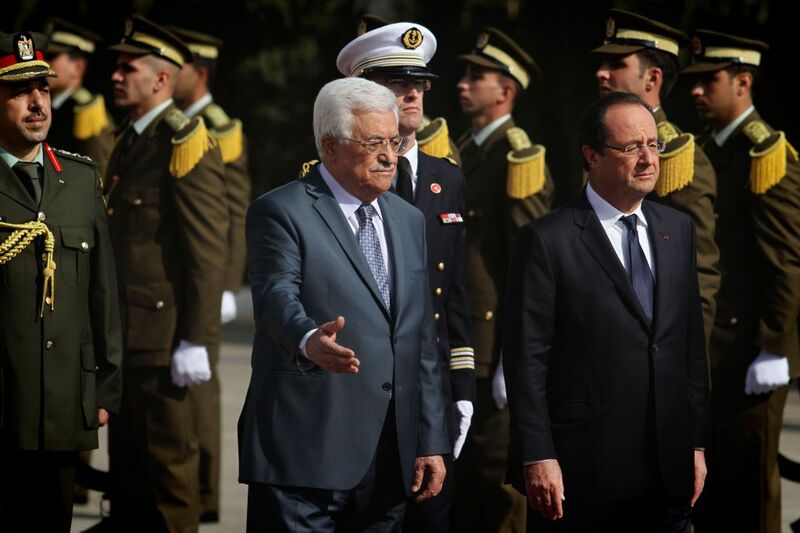 Speaking at a press conference in Ramallah alongside Palestinian Authority President Mahmoud Abbas, Hollande urged both sides to continue to make goodwill gestures to enable an atmosphere conducive to peace. He suggested that the Palestinians give up or at least soften their insistence on the “right of return” for millions of Palestinians, mostly descendants of refugees, to sovereign Israel. Abbas said that, in accordance with the Arab Peace Initiative, a “just and agreed-to” solution to the refugee problem would have to be found. “Let’s sit down around the [negotiating] table and let’s discuss a just solution and see if we can perhaps agree on it, and sign this peace agreement,” the PA chief said. Since arriving in Israel on Sunday, most of Hollande’s comments to the press were about efforts to achieve a deal with Iran over its rogue nuclear program. He traveled to Ramallah on Monday for a meeting with Abbas in the Muqata’a, the third meeting between the two leaders since Hollande took office in May 2012. 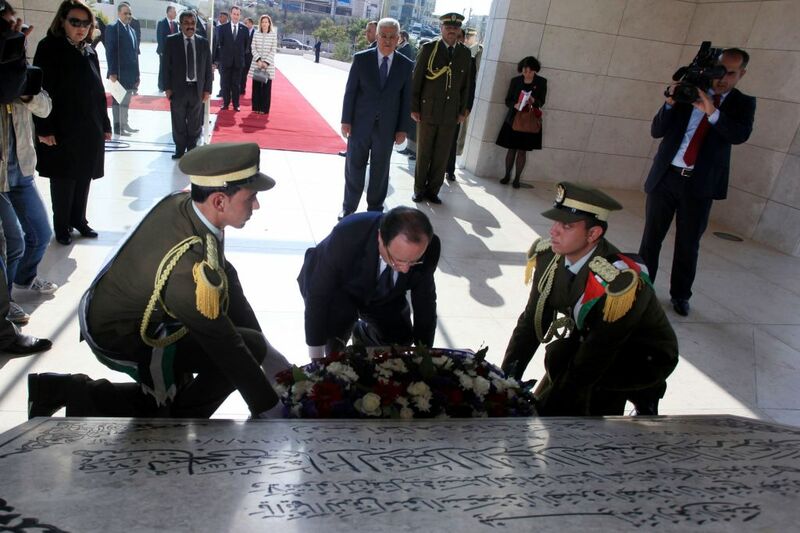 Hollande alsoid a wreath at the grave of the former Palestinian leader Yasser Arafat. Hollande said he was hopeful because Palestinians and Israelis had agreed to negotiate a final-status agreement. Both sides took painful steps to enable this round of talks to commence, “but more gestures are needed if one wants to arrive at an agreement,” he said. The French president mentioned that Netanyahu last week withdrew plans for new West Bank settlement construction, and said that he considered the prime minister’s move to be a gesture that allowed the Palestinian negotiators to continue with the talks. “We are committed and we will go to the full nine months, and then we will take the appropriate decision, Abbas told the AFP news agency. “We have committed to continue the negotiations for nine months, regardless of what happens on the ground,” he added without elaborating. Under heavy US pressure and following intense shuttle diplomacy by US Secretary of State John Kerry, Israel and the Palestinians resumed peace talks in July after a three-year hiatus, agreeing to a nine-month timeline set to expire in March 2014. For the duration of the talks, the Palestinians agreed to suspend their efforts for international recognition and to not pursue Israel in the international legal arena. Israel committed to freeing 104 Palestinian prisoners who committed their crimes before the Oslo Accords were signed in 1993. The second phase of that program of releases was completed late last month. The negotiations have hit some hurdles so far, including an uptick in terror attacks perpetrated by Palestinians, with the latest incident occurring just last week when a 16-year-old Palestinian youth stabbed an 18-year-old IDF soldier to death while the latter was sleeping on a bus. Israel has also made continued announcements of planned construction in the settlements, prompting frequent threats by Palestinian negotiators to quit the talks. A Palestinian Authority official on Monday told Israel Radio that talks with Israel could resume as early as this week. Rick Hodes – an American that would put Iowa Representative Steven King to shame. Please read this in sequence to previous article. Rick Hodes is an American doctor, born May 30, 1953, specializing in cancer, heart disease, and spinal conditions. and who still remembers that medicine practice is not about making money. Since the 1980s he has worked in Ethiopia and has adopted a number of children from the country. Right here you have something that puts him at logger-head with those “God-fearing” Iowan women who hate Obamacare. Dr. Hodes adopted five sick children so that he can help them by putting them on his American Health insurance. Currently, he is the senior consultant at a Catholic mission working with sick destitutes suffering from heart disease (rheumatic and congenital), spine disease (TB and scoliosis), and cancer. He is medical director of the American Jewish Joint Distribution Committee. He is a true humanitarian. Hodes has been responsible for the health of Ethiopians immigrating to Israel and has worked with refugees in Rwanda, Zaire, Tanzania, Somalia, and Albania. Currently, he is the senior consultant at a Catholic mission working with sick destitutes suffering from heart disease (rheumatic and congenital), spine disease (TB and scoliosis), and cancer. He is medical director of the American Jewish Joint Distribution Committee. Hodes has been responsible for the health of Ethiopians immigrating to Israel and has worked with refugees in Rwanda, Zaire, Tanzania, Somalia, and Albania. Special Guest Speaker at Services and Oneg Shabbat. Joint Distribution Committee in Ethiopia. Dr. Rick Hodes is Medical Director of the American Jewish Joint Distribution Committee in Ethiopia. all immigrants from Ethiopia to Israel. He participated in Operation Solomon (1991), the historic airlift of over14,000 Ethiopians to Israel in 36 hours. Dr. Hodes directs JDC’s non-sectarian medical programs and also sees patients at the Missionaries of Charity (Mother Teresa’s Mission). His patients cannot afford medical care, so Dr. Hodes raises funds to care for them. He tends to their souls while quietly living his faith. Dr. Hodes is the subject of the book This is a Soul, by Marilyn Berger, as well as the Sue Cohn Rockefeller documentary, Making the Crooked Straight. Please join us for this very special Friday night Shabbat sponsored by the Social Action Committee. Hodes graduated from Middlebury College, University of Rochester Medical School, and trained in internal medicine at Johns Hopkins University. He first went to Ethiopia as a relief worker during the 1984 famine. He returned there on a Fulbright Fellowship to teach internal medicine, and in 1990 was hired by the American Jewish Joint Distribution Committee, a humanitarian group, as the medical advisor for the country. His original position was to care for 25,000 potential immigrants to Israel. In 1991, he was an active contributor during Operation Solomon, helping the Ethiopian Jews airlifted to Israel. In 2001 Hodes adopted two Ethiopian children, putting them on his insurance plan so they could receive treatment in the US for spinal tuberculosis (Pott’s disease). Since then he has adopted a total of five children from the country. Hodes work in Ethiopia was the subject of a HBO documentary, “Making the Crooked Straight” and a Marilyn Berger book, “This Is a Soul: The Mission of Rick Hodes”.